I think Dawkins deserves one more thread before his number 20 becomes immortalized in Philadelphia Eagles history till the end of its existence. 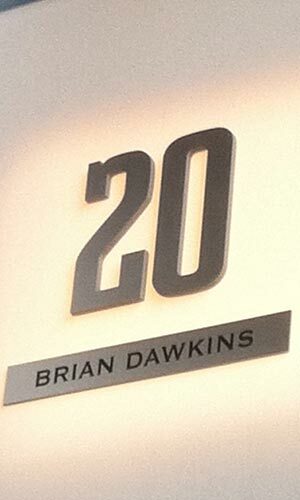 There was only one Brian Dawkins and there will never be another. A guy you knew would bring his 100% every Sunday and for the entire duration of the game. And if others around him weren't playing above and beyond par he would make sure they did. I know we say football is only a game, but we as spectators can come away with a lot from it. No doubt Dawkins inspired many to become more of a leader in the workplace, with their friends, and most importantly among your family. And to never stop fighting. 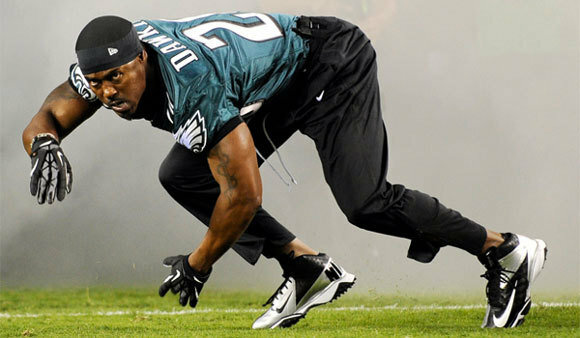 Brian Dawkins will be remembered years down the line in the same way we look back at the Eagles greats like Chuck Bednarik. Most fans have never seen him play (except babyatemydingo and killdawabbit) but we all know his name and what he achieved. One day there will be a generation of fans who never saw Dawkins play live. And for that reason we should remind ourselves just how lucky we were to watch him play. The Andy Reid era has been a mini Golden Age of sorts. Call it a Silver Age then. But this legacy extends far beyond just a few generations of fans. The same way we look at the remaining evidence of gladiators in the Roman civilizations, maybe one day a future civilization will look upon the broken down and old Lincoln Financial Field, and look at our "game" of football as a defining feature of our culture. And they will look to the records, the name of legends that have lived on. And in pictures and video of Dawkins is also thousands of fans who watched and were inspired of him. They are us. And for that reason, the legacy of Dawkins is about us too. I am very greatful that I grew up idolizing Dawk and seeing every game of his Hall of Fame Career (admittedly I was a bit too young at the start). My grandpa always talked about Bednarik like he walked out of myth...and I will do the same with my kids when I talk about Dawk. He transcended sports and was just as good a person as you could hope to be. I met him twice and he was one of the most generous, kind hearted man I've ever met. All that with his unquestioned leadership, tenacity til the whistle, and heart he displayed on the field made for a true legend. He, like Chuck, was the perfect embodiment of talent and passion fused together. Nobody got Philadelphia and its fans like Dawk did. I was so sad when he left, but I'm so happy he is back doing stuff with the team and city. I'm usually not a fan of retiring numbers but if anyone deserved to be immortalized its Dawk. Hes the reason i became a football fan. During the Super Bowl run i watched some of the season, but wasnt too interested. Then in the playoffs i liked it more, but i wasnt crazy for it. Then this happened. and i was hooked. Everything about the Eagles i needed to know. He was my favorite player and always will be. One of the greatest leader's I've ever seen, one of the best defender of the past decade. Wish him and his family nothing but the best. 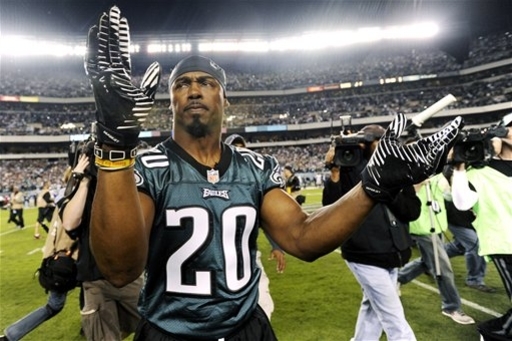 We as a fan base were privileged to witness a person like Brian Dawkins give his heart and soul to our team for 10+ years. Much thanks to him for everything he did. The ceremony was awesome, and I'm glad we pulled off the win on Dawk's night. Look how intense he is in a tunnel entrance in a game he's not even going to play in. Easily my #1 eagle of all time and going to the game last night was one of the better philadelphia sporting events I have been to, can't wait to make the trip to Canton. True that about his intensity. And it's totally sick that you got to go last night. Proud that at least one of us on this forum made it there. Yea I had to pull some strings with my buddy who is the stepson of the TEs coach to get to this one. Those bad boys were EXPENSIVE online.